Have you ever heard of the clepsydra - water clock? Many scientists say that the oldest of them found today can be dated to the era of the pharaohs. Since then, it took about 3,400 years, and the water clock, as if overcome the force of gravity, were in the mechanical wristwatch! Probably, many watch companies have dreamed of such a phenomenon, but to create watch indicating the time with the liquid in the mechanism, only managed to the company HYT in 2012. This article is about it. The most interesting and fascinating - is the principle of how the artist created these unique watches, have succeeded in combining high art of watchmaking and the mechanics of fluids. Agree, at first glance, the idea of the movement with circulating fluid seems an absolute utopia. However, in reality the idea of H1 watch is quite simple. The mechanism consists of two welded flexible tank, fixed at the edges of the capillary tube. In one of the vessels – is fluorescent liquid, which is present in the water, in the second - a viscous transparent liquid. The two liquids do not mix: it's all in the repulsive force of the molecules of each of the liquids. Tanks come together at mark "6" o'clock, and between them there are contact zone, called the meniscus. When the first tank is compressed, the second one – is stretched and vice versa. Thus starts the movement of fluids in a capillary tube. Indication of time is done by moving of the fluorescent fluid through a tube of liquid-pointer. Meniscus in the crescent-shaped marked two liquids, thus indicating the hour. When it reached the mark "12" o’clock the fluorescent liquid is returned to its original position in a retrograde mechanism. The secret of the original tanks’ work in two tough and flexible bellows of electrodeposited alloy, which are moved by the piston. The entire system is activated by the watch mechanism. Unique mechanism, which has become completely new creation in watchmaking, has been designed under the direction of Bruno Mutarle with the assistance of Jean Fransua Mozhon and his colleagues from Chronode SA. As the creators mention one of the main difficulties of mechanism creation has become a means of mechanism interaction with a fluidic system in the form of a closed and tight circle. Set forth at the top of the watch this watch mechanism affects the "cam", which in its turn pushes the piston, the piston already runs the bellows. First of all, the designers reduced the constructive size of both systems. Both systems were installed separately from each other to maintain the autonomy of each system, and then make them work together. Another difficulty in the watch design has become mounting of mottled dial around the edges. Unique watches aren’t created without difficulties! However, as subsequent work shown, the creation of the original mechanism and coherence of its work was much more complicated than the idea by itself. Therefore, for the realization of the concept were included two teams led by Bruno Mutarle. Watch part has been done by Mozhon Jean-Francois and his colleagues from the company Chronode. In creation of liquid part were involved the specialists of the company Preciflex, Patrick Byrd, Lucien Vuiyamo, Emmanuel Savo - the founders of HYT. By the way it should also be noted that employees of Preciflex were also supported by the company Helbling Technik, specializing in the medical field and used the movement of fluid in some of its developments. Adventure, an amazing idea, which is a combination of two antipodal worlds into one, holistic functioning mechanism turned the world of watchmaking, and even medical equipment. This is because it is - a new pump system, which opens the way to extraordinary discoveries in this field. Some of the most important moments in the watch development of the company HYT - Development of fluids that meet technical requirements to build hours. Homogeneous structure and color, resistance to shock and vibration, long wear and temperature changes, tightness in all situations - all of these requirements, which should adhere to in order to get the desired result, led to the development of many new innovative solutions. And today on watch technology has been announced seven patents and one - on design. Assertive, energetic, technically, and very "masculine" - that's how you can characterize the design of this watch created by Sébastien Perret, who was fully able to "charge" watch with testosterone. First of all, it should be noted, three-dimensional structure of dial, which allows you to see work of the mechanism, not only from the front side, but in profile - on-the-mitre, through the sapphire glass, with thickness 5 mm. The dome-shaped mark at the position "6" o’clock – is like a lighthouse, from which "poured" the flow of fluorescent particles. Pistons and bellows give HYT watch an industrial style. Divided into two parts dial - is the embodiment of stair-step and relief geometry. One of the memorable moments for the company HYT has become an annual international BaselWorld watch exhibition 2012, where the company presented a wrist watch HYT H1 Hydro Mechanical Watch with which the company made its debut at the show. That's when it became clear - the model will be an absolute hit of 2012. The original HYT H1 Hydro Mechanical Watch can be characterized as a watch, combining in its design styles of steampunk, hi-tech and traditional elements of classic watch design. 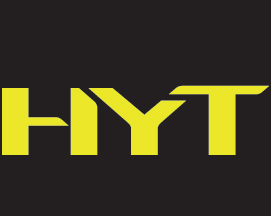 The uniqueness of HYT H1 Hydro Mechanical Watch – is time indication with retrograde fluid pointer, filled with fluorescent liquid. At the bottom of the dial are located two "piston", which control the time scale. At the position "12" o’clock is located minute counter. Indication of seconds is provided by a turbine, which is located between positions "9" and "10" o’clock. Watch, presented at the exhibition BaselWorld 2012, the company presented in three versions: in the case of titanium, of 18K red gold and titanium with black DLC-coating. The size of H1 Hydro Mechanical Watch is quite impressive - in diameter the case has 48.8 mm and thickness - 17.9 mm. The basis of watch – ia a movement with manual winding and 65-hour power reserve. The transparent case back allows you to see work of unique mechanism with beveled edges and Geneva stripes, unique in its kind. In developing the caliber Vincent Perriard consulted with many engineers, including such companies as Chronode and Preciflex. The glass covering the dial – is sapphire of convex shape. Crown - is screwed. Strap of the model model – is textile leather. Buy watch H1 Hydro Mechanical Watch the company offer for $ 45,000. HYT: H2 Titanium & White Gold Blue – unusual indication of time!